There are 2- one bed room self-contained apartments in Runaway Bay Called Caribbean Court Apartment that would be suitable for two people each. The building is located next to Club Caribbean Hotel (now called Royal Decameron) and has a security gate with security guard. The units are on the 2nd, and first floor. The Apartments include air conditioning, Cable TV, Linen, utensils, Microwave, stove, toaster,fridge, and a pool. It is situated close 20 min from Dunns River Falls in Ocho Rios,and close to beach, golf, shopping, restaurants, and attractions. Please click, or copy and paste the link below into your browser for photos. 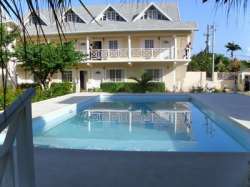 4Bedroom 3.5 Bathroom Vacation House 25 minutes from Montego Bay.